Although Russians living in Seoul weren’t really fazed by President Vladimir Putin's misgivings that North Korea’s nuclear threats might make Chernobyl “seem like a child’s fairy tale,” something approaching fear is bubbling just under the surface. Russians living in Seoul weren’t that fazed by the fears expressed by President Vladimir Putin on his recent trip to Germany that North Korea’s nuclear threats could make Chernobyl “seem like a child’s fairy tale”. The Korean crisis: The peak is over, what next? Russian pundits: Still calm about Korea? We have become used to the sabre-rattling from Pyongyang. Indeed, many had high hopes of Kim Jung-un, due to his western education and influences, but fears are now growing that he is simply, well, too young. Most of the Russian population in Korea are Russian-Koreans, as well as exchange students and white-collar employees at multinational companies. Maria, a 20 year-old exchange student from the Siberian republic of Buryatia, is not worried: The South and its western allies will find a way to buy off the North. 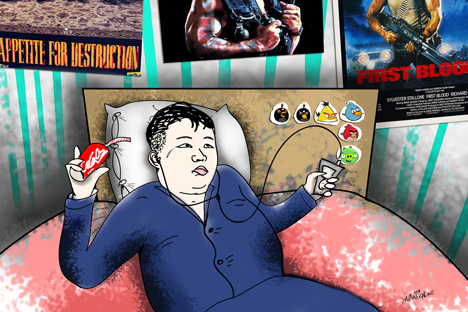 It’s not quite clear, however, just what is closest to the young dictator’s heart: American movies and fast food, or anti-American nuclear rhetoric and military parades. In recent days, Seoul seems more preoccupied with climate change than the North’s missile test (the country has had some freak cold weather this spring) – that, and the new song from Psy, creator of the Gangnam Style dance phenomenon. Still, something approaching fear is bubbling just under the surface. I try to calm myself by watching news reports on South Korean TV, as they blithely inform viewers that Kim Jong-un enjoys using Apple computers. And, just to be on the safe side, I finally register with the Russian embassy here, after living in the city for 18 months. Over dinner, I ask Shin, a Korean friend of mine: “Do you know where the nearest bunker is?” in the hope that at least the Koreans themselves know what to do in case of war. “Umm, the nearest one is close to where I live – but I’m not sure it’s working…” Reasonably informed, if not altogether reassuring. Lidia Okorokova is a freelance Russian journalist living in Seoul.